Genetic Novelty Score is an indicator of how many other varieties in our database have genotypes similar to Purple Punch 'Supernova Gardens Breeders Cut'. Rare genotypes have very few genetically similar neighbors in the Phylos Galaxy, whereas common genotypes have many genetically similar neighbors. The bar to the right shows population heritage for Purple Punch 'Supernova Gardens Breeders Cut'. The Phylos Galaxy features 6 distinct genetic subgroups, and every sample in the database is represented as a vertical stacked bar in the plot above and on the left. Population structure will continue to evolve as more samples are added to the Phylos Galaxy. 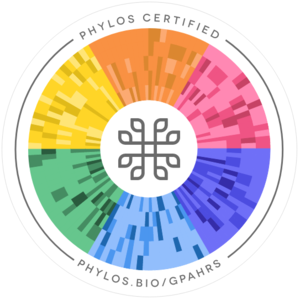 We are redirecting you to the Phylos Galaxy view for Elite Phenos's Purple Punch 'Supernova Gardens Breeders Cut' in 5 seconds.